While canoeing on Kennebecasis River in New Brunswick, Canada, a small to medium bird, fully black, except for a thin white band around the neck and white tips of the wings, followed us around. I've been searching the internet but can't seem to find such a bird. Anyone who can help? Was it in the trees, on the shore, or just flying above you? Did it make any sounds? It flew from tree to tree, landing on a tree branch a few yards before us, and when we turned the canoe around, it came back, flying before us again, landing on tree branches. It did this for about twenty minutes before we came to a river mouth where a family of four bald eagles suddenly appeared. Then, it left us. It didn't make any sounds. Maybe... It was a cloudy day, but it looked completely black and the white really stood out. This photo of a blackbird is pretty similar to what we saw, but - if I remember correctly - its beak was dark. The white band around its neck looks almost exactly the same as on the bird we saw. 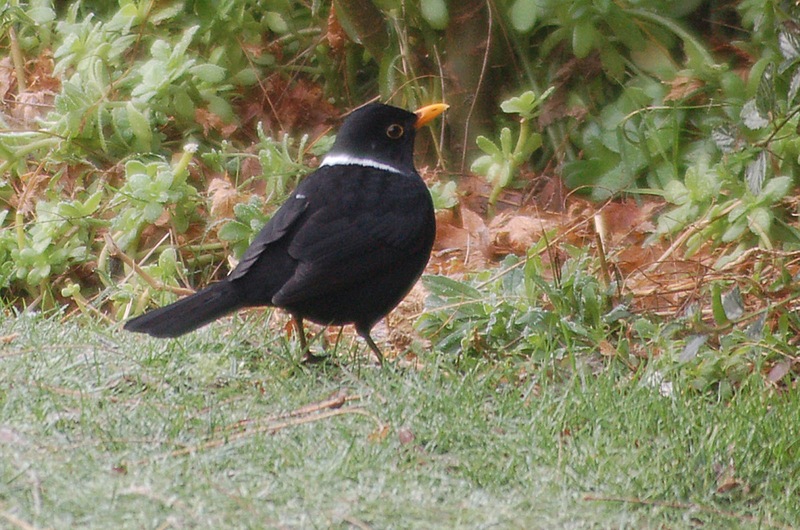 According to the site, this blackbird originates from the southern hemisphere, not Canada. I don't know much about birds, so I have no clue about how likely it would be for such a bird to be in New Brunswick, or if the blackbirds have that kind of behaviour. Can't seem to find how to edit the posts, but, as an addendum to the previous post, I don't think the bird we saw was a blackbird. On the photo above it doesn't have any white wing-tips. Also, the kingfisher (beautiful bird, btw) have white on its wings, but not on the tips, as far as I could see on the photos. Next time, I'm bringing my camera and hope I'll see the bird again.